Most people think of landscaping as rocks carefully placed, manicured lawns, and large trees scattered about a property. However, a garden can make a very attractive addition to any landscape. Whether it is a herb garden or whether it is a vegetable garden, these features can be just as beautiful as any other landscape element, and provide added benefits as well. Well maintained vegetable and herb gardens also provide other benefits: they are a source of food and can be a source of very pleasing smells. Many people plant parsley, rosemary, and thyme in their herb gardens, but there are other herbs that can be planted as well. Cilantro is a little milder than parsley, and it has a different look. Mint is another herb that many people do not think to plant, as is lavender. Both of these herbs look different, and they both give off very nice scents. Another herb with a very attractive smell is Roman chamomile. Even though some of these herbs may be less frequently used, it is possible to find plenty of recipes that use them, and lavender and chamomile are noted for their usefulness in providing an atmosphere of calm. So even the scents can be of use. Simple bring them into the house and enjoy the feelings that accompany the smell. 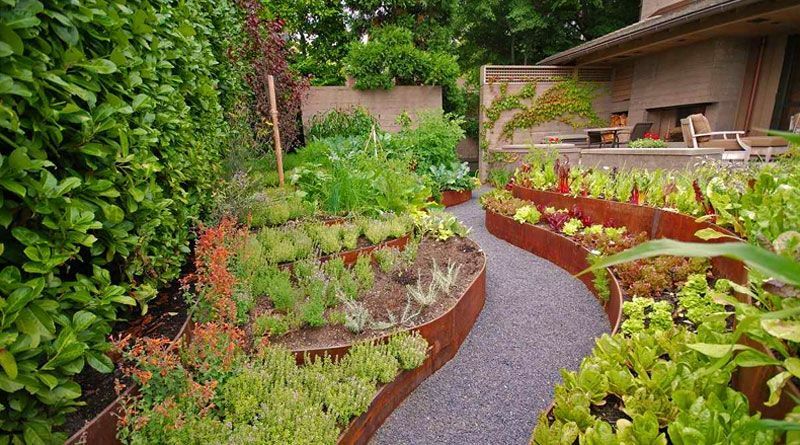 Vegetable gardens are other edible landscaping devices that can look very attractive. They, too, can be planted in a variety of climates, and can be grown in a variety of soils. There are some plants that grow only in certain regions, but your basic garden fare can be grown almost anywhere. Just the look of green plants has been shown to be soothing, and when you grow your own food, it adds another dimension of satisfied feelings associated with self-confidence and accomplishment. Every vegetable has its own look to it, and so it is possible to enjoy a variety of different looks by carefully choosing the plants that you grow. However, you should choose, first and foremost, plants that you will eat. If you are not going to eat much squash, avoid planting it. But there are plenty of vegetables that have very attractive looking plants and even flowers. Peas have cute little flowers and send up beautiful curly vines. And there are many species of pepper that look beautiful after the fruit has arrived, with their yellow, greens, and reds. When you use herb and vegetable gardens as part of the landscape, there is no need to plant them all together in one place. Spread them around the yard. Use tomato plants and squash plants (including pumpkins) can be used as accents. Herbs make excellent ground cover. Most vegetables and herbs can be grown very successfully in containers. You can make a very attractive landscape design if you use flower boxes for your herbs, and if you use quaint old antique washtubs for things like beans. Pretty sticks can be decorated to emerge from decorative tins for your peas. The great thing about growing vegetable and herb gardens as part of your landscape is the fact that they are edible. They do not cost very much to plant, and they can save you even more money down the road when you buy less produce at the grocery store. Additionally, if you have too much you can always bottle or freeze it for later. Many people use the excess plants from their gardens as gifts to their neighbours or family members. There is no reason to relegate herb and vegetable gardens to some hidden corner of the property, or even to garden in a conventional way, with large plots. You can add distinction to your yard by using the unique and inexpensive method of landscaping with herbs and vegetables.